After 31 years in the airline reservation industry, and one-and-a-half years from retirement, Chris Siapicas' job at United Airlines was outsourced and his pension forfeited. Instead of planning his retirement, Siapicas was left looking for a new career. That search led him to Seattle Central Community College's Worker Retraining Program. Mary Lockman, the program manager, helped him turn a minus into a plus. Siapicas entered the web development program in summer 2005 and will graduate this spring with honors. Lockman's employment specialist career includes a stint as a startup manager for Ben & Jerry's partner shops in Times Square, where she trained adults who had been deemed unemployable -- everyone from new immigrants and the homeless, to those with chemical dependency or mental heath issues. Lockman has become an expert at what she describes as "capturing people's strengths and rerouting them." "Being laid off, going back to school, collecting unemployment, the whole process can be complicated and stressful," Siapicas said. "But they found ways to lessen the financial impact. For example, Lockman helped hme with the process of extending unemployment benefits, something I wouldn't have known about on my own." Most WRP clients are adults undergoing major, life-altering career changes. "These are not 18-year-olds trying the world on," said Pegi Hurd, WRP program coordinator. "These are people, who in the midst of their lives, are suddenly and unexpectedly faced with a crossroads. And these days, education really never ends. All workers must be lifelong learners to stay ahead of the curve." Students describe Hurd as a great advocate, not only at the school, but when students get beyond school. A lot of these students may not have anybody in their lives helping them out. Worker retraining provides funding, academic and advising source that essentially retools students, through workforce education programs, to return to the job market as soon as possible. 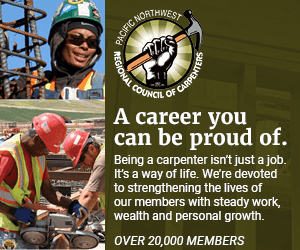 The program is offered at all Washington state community and technical colleges, and serves dislocated workers, displaced homemakers and even small business owners and consultants who don't have the competitive skills to meet market demands. Eligible students may receive financial assistance that could include tuition, books, bus passes and fees. Seattle Central's WRP office also provides resume services for all WRP students as well as job search and placement assistance and even post-grad job counseling. All of this is done on an individualized, personalized basis. More than 50 potential students are interviewed each week in the WRP office, or attend an orientation session. Students find a staff sensitive to their circumstances, ready to offer advice, counsel and even a Kleenex. Sherry Stroud, a single parent with three teenage children, found herself laid-off and back in school. Stroud is now an accounting manager employed full-time at Highline Community College. "What made me successful this time as an adult student was that I was doing this for me and recognizing that it is hard work being a parent and a student, but it can be done," Stroud said. "Following the advice from my Worker Retraining staff, I can clearly remember them saying never sit in the back of a class; always try to be seated in the front. That simple piece of advice made such a difference in how I received the information being taught." "These students have been interrupted in their careers by a lay-off or lack of skills," Lockman said. "Often they don't want to be here, but they want to pay their rent or mortgage, utilities and car, feed their children, and they recognize they need to be here in order to continue to do those things. But, they're not often aware of what it will take to put their lives back together. Maybe the industry they loved has gone away and there's a process of letting go and even grieving for that industry." Some WRP students simply upgrade their skills within the same industry, rather than starting over. "Instructors here are extremely helpful and want you to succeed. You need only ask and they will go the extra mile to help you learn," Siapicas said. "They will use different examples, other teaching methods, describing the problem using other words." The entire WRP staff, Lockman, Hurd, Portia Bell, Barbara Coston and Errol Nelson, has earned a reputation as a caring, compassionate and competent group and all enjoy their opportunity to positively impact students' lives. If you think you might be eligible for worker retraining, call 206-587-6310. Free orientations are held at the Seattle Central Community College, 1701 Broadway, every Thursday at 2 p.m. in room 4180. Park in the garage at the corner of Harvard and Pine. Spring quarter classes begin April 2. Training is available in 30 programs including Information Technology, Health Care, Design and Communications and Carpentry. For more information, visit www.seattlecentral.edu/wrp.